Each chemical reagent used has its own effectiveness in terms of the size of the floc formed: granular with mineral reagents and more voluminous with polyelectrolytes. Mineral reagents are better suited to dewatering using filter presses (see filter press). In effect, they produce fine but very strong floc. There are many polyvalent cation mineral electrolytes that can be used but, on grounds of cost and effectiveness, the ones that are the most frequently used are iron or aluminium salts such as ferric chloride and, to a lower extent, ferric chlorosulphate and ferric sulphate and, more rarely, ferrous sulphate and aluminium salts. The Fe3+ ion is by far the most effective and the widely used reagent on organic sludge (WWTP and IWWTP biological treatment).The choice between FeCℓ3 and FeSO4Cℓ is driven by financial considerations. injecting a dense mineral loading (increasing the cake’s permeability). The dual iron salt/lime injection is compulsory when processing organic sludge. On the other hand, with hydrophilic hydroxide sludge, merely adding lime will usually be enough to improve sludge filtration capacity. In order to ensure that the filters are operated correctly, we need to apply a minimum amount required in order to achieve sufficient filterability (chamber type filter press: r0.5 of 5 to 15 × 1011 m · kg–1); however, overdosing is pointless as this would only marginally improve results. We always recommend that simple laboratory tests are used to determine the right amounts in each case. (see sludge examination and numerical characterisation of filterability r0.5 and CST measurements). 80 to 90% of the mass of Ca(OH)2 injected will also appear in solid form. By correlation, a certain proportion of the reagents will render soluble as Cℓ– or Ca2+ and be discharged in the filtrate. The aim is to achieve an excellent reagent/sludge mixture. Adding dilution water (for the concentrated FeCℓ3 solution) and the use of a 50-80 g · L–1 lime slurry will make it easier to diffuse the reagents throughout the mass. Sludge is flocculated in succesive mixed tanks (the first for metal salt, the second for lime – see filter press). Contact time ranges from 5 to 10 minutes which is enough for the floc to grow. Agitation energy is quite high (150-300 W · m–3) without being excessive. An additional floc maturation period may be beneficial but agitation that is too prolonged and too vigorous can damage the conditioned sludge’s filtration capacity. Prolonged conditioned sludge storage prior to filtration (sometimes useful for filter operation) can also be damaging, especially with fresh sewage sludge that has not undergone sufficient lime treatment and is, therefore, likely to become worse. Floc must not be destroyed as the result of flocculated sludge transfer: therefore, centrifugal pumps must be avoided in preference to eccentric rotor type pumps. For some types of abrasive sludge, piston/diaphragm HP pumps are preferable. The conditioning unit can be wholly automated, with reagent use governed by flow rate and, if applicable, by sludge concentration. Only long chain synthetic polyelectrolytes (polyacrylamid based, high molecular weight) are effective, forming voluminous floc (a few millimetres) that withstands shearing stress and that is clearly separated in clarified interstitial water. significantly decrease the specific resistance of the sludge, the interstitial free water released being rapidly drained off. On the other hand, this floc is often spongy and fairly hydrophilic and will induce a higher sludge compressibility factor. a marked improvement in centrifuge performance (output but, above all, dry solids content) through a very noticeable increase in the density of the assembled particles (see centrifugation). evaluate pressed floc adhesion to the filter belt; taking all these points into account, selecting the appropriate polymer(s) and the most cost-effective amount to be used. The final choice of product is made after the short-listed products have undergone industrial tests. Cationic polyelectrolytes are particularly effective when treating sludge with a high organic matter content (OM/suspended solids greater than 40%) or a high cellulose fibre content. For some applications (e.g. dewatering using a filter press), the polyelectrolyte can be used in conjunction with a metal salt: ferric salt used for preliminary coagulation, followed by polyelectrolyte to produce a less hydrophilic floc. Polyelectrolytes having a medium gramme-molecular weight are more suited to pressure belt filtration (easier draining).Those having a very high gramme-molecular mass, generating dense and very shear resistant floc, are better suited to centrifugation. 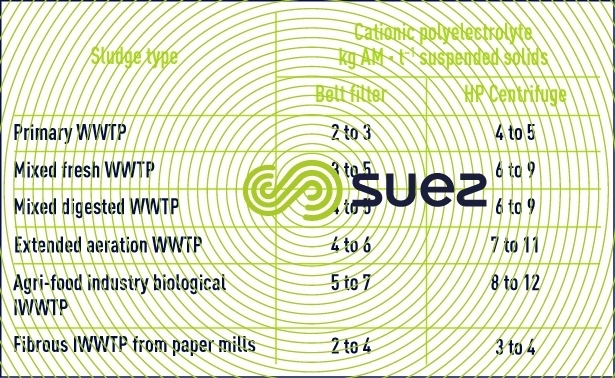 Anionic polyelectrolytes are widely used in sludge suspensions with a predominantly mineral content (dense hydrophobic sludge, metal hydroxide sludge).The amounts used in the case of these polymers are often more modest, in the region of 0.3 to 3 kg · t–1 suspended solids. When organic sludge (e.g. biological sludge) is mixed with mineral sludge (e.g. hydroxides), polyelectrolyte ionicity can vary depending on the co-ratio involved. 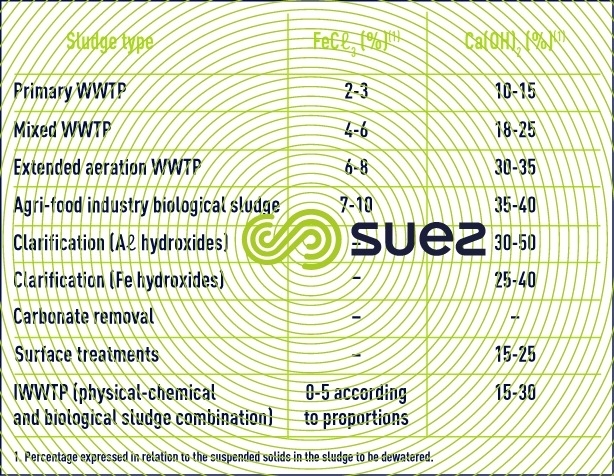 Polyelectrolytes used in sludge treatment are supplied as a powder or, increasingly at present, as a stable emulsion. The chapter on special applications provides general recommendations and diagrams for systems used to prepare these polyelectrolytes. Powder polyelectrolytes are usually prepared to maximum concentrations of 2 to 4 g · L–1; this solution has to be allowed to «mature» for about one hour before use. In general, polyelectrolyte solutions prepared from powder will only remain wholly effective for 2 to 3 days. the solution then has to be allowed to mature for approximately 20 minutes while being gently agitated. When using a polymer emulsion, do not confuse the amount of commercial product with the actual amount of active product: in general, emulsions contain an active matter (AM) concentration of 40 to 50% for a density close to 1. When comparing polymer emulsion consumptions with those of polymer powders, this comparison must be made using amounts expressed in kg of active matter or in euro · t–1SS. injection methods become more complex with filter presses.The filter press output is not constant throughout the cycle and, therefore, several operating options arise:injection before or after the filter press HP feed pump, into reactors or in-line with suitable automated control systems(see filter press).